More recent publications on Christians and family planning (Healthy Timing & Spacing of Pregnancies) appear first. See sections such as Scriptural Support and Commodity Security for CCIH publications on those topics. While CCIH and our members work on a wide variety of global health issues, we have answered the calling to advocate from a Christian perspective for access to family planning/HTSP services to protect the health of mothers and children. 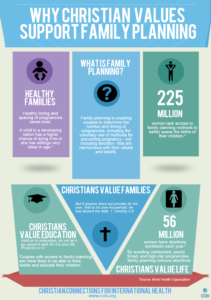 CCIH produced this infographic to help Christians discuss why family planning/HTSP is consistent with Christian values. Success Story: Training Religious Leaders as Family Planning/HTSP Advocates | May 2016 | With support from USAID’s Advancing Partners and Communities project, CCIH worked with its partner the Uganda Protestant Medical Bureau to educate religious leaders on family planning/HTSP and train them to advocate for family planning among Christians, within their congregations and communities. After the training, religious leaders had significantly improved their knowledge of family planning/HTSP. Faith Matters: A Christian Approach to Engaging Youth in Family Planning | June 2015 | This fact sheet was produced with support from and in collaboration with USAID’s Advancing Partners and Communities. Every year more than 7 million girls under the age of 18 give birth in developing nations, and pregnancy and complications from childbirth are the leading causes of death for adolescent girls in the developing world. This fact sheet addresses these serious issues and helps Christians connect his/her Christian faith with family planning to improve the health of young people. It also provides direction on how faith-based organizations can address healthy timing and spacing of pregnancies in their communities. Family Planning and Reproductive Health Supplies Stockout Report | September 2015 | This report outlines the research and findings from the first phase of a project funded under the Reproductive Health Supplies Coalition (RHSC) Reducing Stockouts Initiative to build evidence on the unique supply and supply chain challenges faced by FBOs. The goal of this phase was to identify distinct types of supply chain systems used by Christians and Muslim organizations, the performance of the types in terms of stockouts, and the associated challenges these supply chain systems face that contribute to stockouts. The findings from this phase point to possible approaches to addressing challenges these types of supply chain systems face that result in stockouts. The study evaluated FBO stockouts and key drivers of commodity security, such as sources of products, facility inventory and storage practices, financing, and more. Research methods included an initial email survey, subsequent phone interviews, and in-country visits in Cameroon and the Democratic Republic of the Congo (DRC). The responses helped to validate a typology of supply chain systems and offered clarification and information to advise future supply chain interventions. 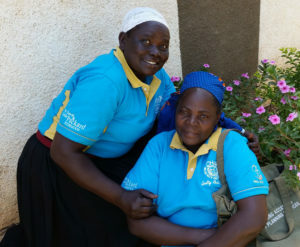 Community Health Workers in Kenya who provide family planning services. This fact sheet discusses how family planning helps reduce abortions with compelling quotes from key prominent Christians working in public health on the effect of family planning in preventing unintended or unhealthy pregnancies. Faith Matters: International Family Planning from a Christian Perspective | December 2014 | This booklet was produced with support from USAID’s Advancing Partners and Communities project. It was the result of a two-day consultation of a group of Christians to advance a constructive dialogue on family planning from a Christian Perspective. The meeting was hosted by the Salvation Army World Service Office in Alexandria, Va., USA and was attended by 48 representatives from 26 international health organizations, various Christian denominations, and USAID. It is designed to help faith communities discuss family planning from a Christian perspective and provides evidence of why family planning improves maternal and child health, along with lists of resources for more information. 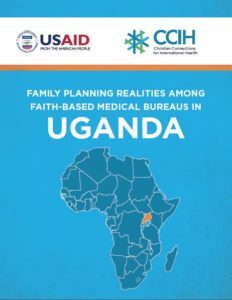 Family Planning Realities in Uganda | December 2013 | CCIH commissioned a family planning (FP) survey of faith-based private not-for-profit (FB-PNFP) health facilities in Uganda in 2013. The survey revealed that the facilities are well positioned to take on additional family planning service provision, including both counseling and provision of FP methods. 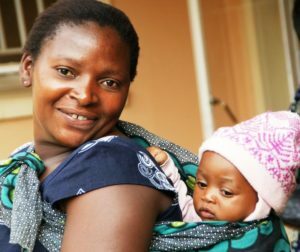 Getting Contraceptives to Health Facilities: 10 Questions for Community-Based Groups to Consider | Many couples in the developing world want to space their children because they know that adequate time between pregnancies is healthy for mothers and children. Men and Family Planning | April 2013 | Christian Connections for International Health with support from the United Nations Foundation | Evidence suggests that men’s active participation in decisions about family planning and reproductive health promotes better health for families. But traditionally, family planning counseling and education efforts have been aimed at women. To help organizations understand the benefits of involving men in family planning and to share examples of FBOs successfully engaging men, CCIH prepared this fact sheet on the topic. The piece features a review of studies on the issue and includes the work of CCIH members and affiliates the Adventist Development and Relief Agency, the Institute for Reproductive Health at Georgetown University and World Vision. International Family Planning: Christian Actions and Attitudes | 2008 | CCIH, USAID and Georgetown University Institute for Reproductive Health | In 2008, CCIH conducted a survey of its member organizations to determine their attitudes toward family planning and discover what services they provided. According to the survey results, “Family planning” and “reproductive health” are widely acceptable terms among the Christian international health community, especially if understood to mean voluntary prevention of pregnancy, and if they explicitly exclude providing or promoting induced abortion. Slightly over half of the 67 CCIH member respondents provided family planning services or assistance to programs and partners. In terms of FP integration, members are already doing or would consider integrating FP with HIV/AIDS testing and care settings, preventing maternal-to-child transmission of HIV (PMTCT), child health, and as a part of maternal health services for women receiving postpartum and post-abortion care. See an Executive Summary of the survey.